Even some of the smartest college students don't make the grade when it comes to handling their credit cards, and it remains to be seen whether the new credit card regulations affect the learning curve. Under the new rules, issuers cannot market credit cards on campus, and they can't let students open accounts unless they can prove they have sufficient income to pay the bills or get adults to cosign. The most recent data indicates that the average college student carried a credit card balance of $3,173, and seniors graduated with an average credit debt of more than $4,100, according to Sallie Mae's latest national study of student credit card use. Among those students, 60 percent said they were surprised by how much the balances ballooned, and 40 percent said they charged items they knew they couldn't afford to pay off. 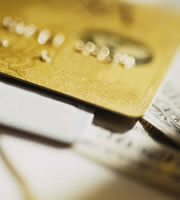 The average college student had more than four credit cards, according to the Sallie Mae study. But rarely does anyone need multiple credit cards. It's appropriate to have two -- one for primary use and one for backup. Getting a credit card because other accounts are maxed out is often a sign that someone is heading for financial trouble. Maxing out credit cards can hurt one's credit score, a statistic designed to favor those who keep their balance below 30 percent of their credit limit. Of the students in the Sallie Mae study reporting that they carried credit card debt, only 17 percent said they paid their balances in full every month. With average credit card rates in the double-digits, students should do everything they can to avoid expensive finance charges. Most undergraduates, 84 percent, reported in the survey that they needed more information on financial management. A third of the students surveyed said they had rarely, if ever, discussed credit cards with their parents. Not surprisingly, those students were also the most likely to be amazed at how fast their balances grew. 0 Responses to "The 4 biggest credit card mistakes college students can make"